A favorable rate of exchange might be the best reason to visit this pretty, but still developing island off the coast of Venezuela. Margarita Island benefits from the same low rainfall (they boast 320 days of sun per year), varied terrain, and steady cooling breeze from the trade winds as Aruba, Bonaire,​ and Curacao -- her cousins to the west -- but at a fraction of the price. It’s something of a diamond in the rough for stateside travelers. Like the Dutch A-B-C islands, Margarita offers everything from white sand beaches to rocky mountain horseback rides, mangrove tours, and 24-hour casino gambling, but with a distinctly Spanish flair. 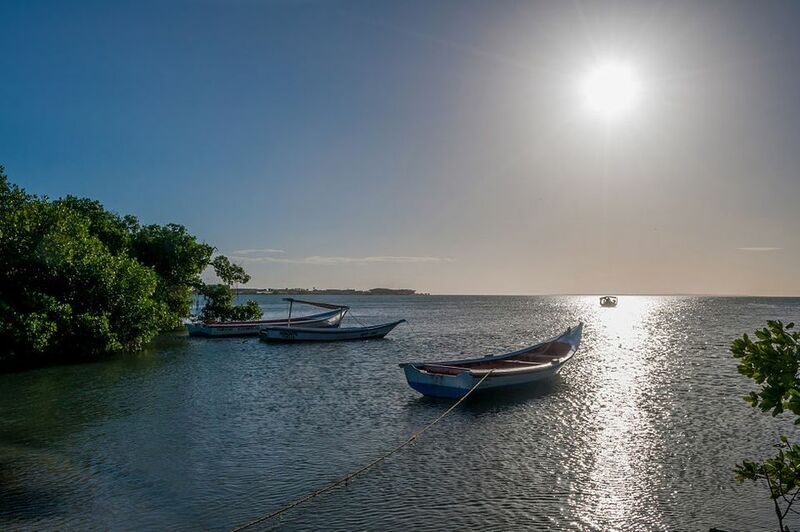 The island was 'discovered' by Columbus in 1498 and won its independence from Spain in 1814; history buffs will enjoy touring the colonial-era forts and churches that dot the island, as well as the many landmarks where Simón Bolívar began his revolutionary march across South America. The usual Caribbean activities are present –- snorkeling, diving, sunning and fishing -– but windsurfing is king, with hotels such as Surf Paradise catering specifically to those who want to play in Margarita’s local waters. All of the island’s beaches are public, though you’ll find the most action at Playa El Agua and Playa Parguito. With a good exchange rate often comes tradeoffs, and Margarita is no exception. Though a number of hotels, such as the Hesperia Isla Margarita and the Hesperia Playa Agua claim four- and five-star ratings, there are no true upper-tier accommodations on the island. Hesperia Isla Margarita comes closest, with its manor-style house, large garden and grounds, and the island’s only 18-hole golf course, but it may still fall short of upscale travelers' needs. On the other hand, you can stay at an all-inclusive like the Dunes for a little over $200 per night, a junior suite at Costa Caribe for a little over a hundred. Crime -- including violent crime -- is a major problem in Venezuela, and while Margarita Island may be safer than the mainland by some measures, visitors are advised to check the U.S. State Department's website for current travel alerts and warnings before booking a trip.